The Anne Beadell Highway runs for 1350 km from the SA opal mining town of Coober Pedy due west to Laverton in WA. With only one fuel (and shower) opportunity at the Ilkurlka Roadhouse and limited water availability this track rates higher in difficulty due to its remoteness and isolation. In the SA section daily kilometre averages are down to around 150 per day due to the relentless corrugations. I suggest you plan for at least 8 days to fully appreciate this unique landscape without breaking your vehicle. It is so remote I only saw 2 other vehicles in 10 days during my trip May 2006, so please be 110% prepared and have a satellite phone or HF radio. 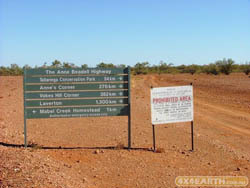 Several permits are required to pass through aboriginal and government restricted areas.The road was created to support the Woomera Rocket Range and the British nuclear tests after World War 2 by the incredible Len Beadell who named it after his wife. Apart from the short section to Mabel Creek on the first day the SA part has not seen a grader since the 1950’s. The track is so overgrown scratches on your car are inevitable and most of the approximately 1000 sand dunes you cross have doglegs to avoid washouts etc either before, during or after so lower speed is recommended due to the possibility of meeting oncoming traffic. The worst is over and the track improves once you enter WA. Please don’t let any of this deter you. The desert doesn’t come much better than this with cold clear nights, beautiful days, magnificent sunsets and camels – hundreds of them! There a numerous short side trips, each of which is worthwhile and rewarding. The track displayed covers the 960 km from Coober Pedy to Neale Junction. On my trip we turned north from here along The Connie Sue Highway for 300 km to Warburton on The Great Central Road.